Blue Creek offers gift baskets for every occasion stuffed with gourmet treats, bath essentials and other exciting gifts. Gourmet gift baskets for holidays, birthday, or housewarming. Creative and unique gift baskets purchased on line. Each custom made gift basket is hand crafted and filled with a variety of products to please the palate and relax the body. 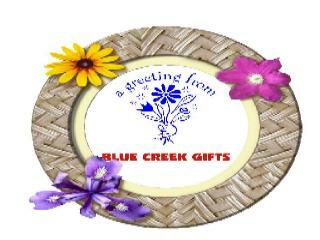 Blue Creek gifts are great for any occasion or gift giving situation. Call and get your own custom theme. We are glad to assist in putting together a gift that will please even the most difficult recipient. View our products and please call if we can help. Gift baskets for any occasion. Beautiful gifts specifically decorated to reflect the ambiance of the season or special holiday. Put those favorite beverages on ice great for any occasion.